I was immediately interested in a review copy of this book from Christian Audio for two reasons. One, a book called The Pastor's Kid: Finding Your Own Faith and Identity was written by a Pastor's Kid, but not by just any Pastor's Kid... It was the Pastor's Kid of all Pastor's Kids... Barnabas Piper (Son of John Piper). That is interesting. There is a bit of sarcasm there, obviously. 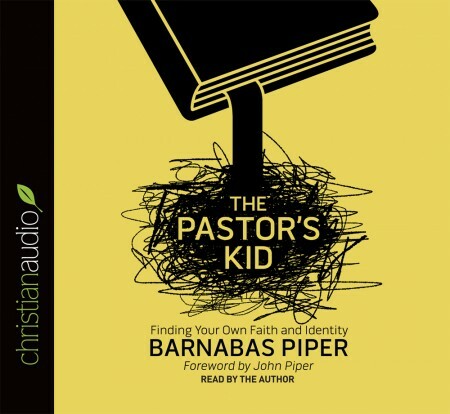 Barnabas Piper isn't really the Pastor's Kid of all Pastor's Kids. Especially since John Piper has other kids! And yet... there is still something in the name. A book written by any of John Piper's children would be of some interest to me, and surely he knows that as well. Second, and this reason is a bit more important to my heart, I have two Pastor's Kids living in my house. They are my two sons, and I have an ongoing concern for them. As far as I can tell, my boys are doing great. I love them to death, they are not perfect, but I am exceptionally proud of both of them. They both display talents and skills that remind me of myself, but also far exceed myself. They seem to be doing well, and for the most part, happy with life and aware of those spiritual realities that pertain to them. But I am not so naive to believe that my being a Pastor, and especially a bi-vocational Pastor, doesn't have an affect on their lives... and I'm sure it isn't all positive. I found this book to be very convicting. Barnabas Piper writes with an openness and honesty that had a tendency to cut deep. It was eye-opening. I became aware of many things that my boys encounter, that I hadn't put much thought into the affect on their lives. It was honest. He was transparent about his home life with its positives and negatives. It was interesting to hear him say that he didn't really care about John Piper's sermons... they aren't that important to him... but then he said that he would much rather sit down with his dad and have a conversation. In other words, he isn't really concerned about Pastor John Piper, but he loves John Piper his dad. Interesting, isn't it? This book was also Biblical. I will admit, not as Biblical as John Piper's books, but this book was personal and experiential in nature, which changes things. But it was still Biblical. Through the course of this book, as challenges were shared, he continually pointed back to the Grace of God found in Christ. This book was also filled with quotes from several other PK's from around the country. Their insights were very valuable to me, and it has given me something to consider about my own children's lives. Barnabas Piper did the audio of this book as well. I love when a book is read by its author. There is something extra that comes through when the author takes the time to read through their own work. There are bits that might not have seemed important, that because of the way the author reads those lines, you know there was something meaningful there. I would recommend this book, not just to Pastors or their Kids, but to anyone in a church. What a PK faces is somewhat unique. Everyone in the church should keep this in mind and remember that PK's are sinners too, just like you. And PK's need the grace of God, just like you.